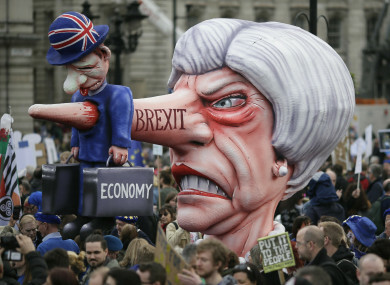 An effigy of British Prime Minister Theresa May is wheeled through Trafalgar Square during an anti-Brexit march in London on Saturday. BRITISH PRIME MINISTER Theresa May is continuing in her last-ditch attempt to get a Brexit deal over the line as speculation about her future mounts. May is due to hold a Cabinet meeting today to discuss holding a third House of Commons vote on the Withdrawal Agreement. Meanwhile, the European Commission said it has completed preparations for a no-deal Brexit, noting “it is increasingly likely that the United Kingdom will leave the European Union without a deal on 12 April”. MPs will this afternoon start debating the government’s motion on the Withdrawal Agreement as well as seven amendments that have been tabled, including one that could see a series of indicative votes on how to move Brexit forward. If this amendment is passed, the Guardian reports that MPs may vote on Wednesday on a number of issues including May’s current deal, departure from the customs union, Brexit with both a customs union and single market, a Canada-style free-trade deal, leaving with no deal, a second referendum or revoking Article 50 altogether. The votes would not be legally binding and may not be acted on. The European Council last week agreed to delay Brexit until 22 May if British MPs back May’s deal this week. If the UK parliament doesn’t vote in favour of the Withdrawal Agreement – a deal it has already overwhelmingly rejected twice – the new deadline would be 12 April and Britain will be expected to indicate a way forward before that date. The UK would then face the choice of participating in the European Parliament elections at the end of May or exiting the European Union without a deal. Britain was due to officially leave the EU this week, on 29 March. May had wanted to delay Brexit until 30 June but welcomed the extension, insisting Brexit will still happen. Some Brexiteers have suggested the delay is part of a wider attempt to stop Britain from leaving the EU. In a statement issued this morning, the European Commission said: “In a ‘no-deal’ scenario, the UK will become a third country without any transitionary arrangements. “All EU primary and secondary law will cease to apply to the UK from that moment onwards. There will be no transition period, as provided for in the Withdrawal Agreement. This will obviously cause significant disruption for citizens and businesses. The statement added that despite the “considerable preparations” of the Member States’ customs authorities, these controls “could cause significant delays at the border”. Similarly, UK citizens would be subject to additional checks when crossing borders into the EU – which could also cause delays at ports and airports. An anti-Brexit march in London drew an estimated crown of more than one million people on Saturday. The Put it to the People protest, one of the biggest demonstrations in recent British history, demanded a second Brexit referendum. More than five million people have signed an online petition calling for the British government to cancel Brexit by revoking Article 50. May has repeatedly said she won’t do this. The petition states that a “second Brexit referendum may not happen – so vote now”. As negotiations to get more MPs onside continue, May’s own future as prime minister appears to hang in the balance. “MPs have been unable to agree on a way to implement the UK’s withdrawal. As a result, we will not leave on time with a deal on 29 March. This delay is a matter of great personal regret for me,” May said in a televised speech on Wednesday night. Her address was sharply criticised by many MPs, from across the political divide, who viewed it as an attempt to shift blame for the ongoing crisis from herself to others. Conservative Sam Gyimah said “resorting to the blame game” was “a low blow”, while Labour’s Lisa Nandy described the speech as “disgraceful”. Describing her speech as “incendiary and irresponsible”, Labour MP Wes Streeting said May would be partly responsible “if any harm comes to us”, noting that MPs have been subjected “credible” death threats. When later asked if she would apologise for her comments, May said she understands that MPs are frustrated, saying so is she. “There are passionately held views on all sides of the argument,” she noted, adding that the House of Commons now has a “clear choice” between an “orderly” Brexit and a no-deal scenario. European leaders including Taoiseach Leo Varadkar have repeatedly said the deal cannot be renegotiated. Doubt was last week cast on over whether or not the House of Commons would actually vote on her Brexit deal for a third time. John Bercow, Speaker of the House of Commons, said the government cannot have another meaningful vote on the deal if changes are not made to it. Solicitor General Robert Buckland claimed the UK was facing a “major constitutional crisis” as a result. Email “Europe says no-deal Brexit looks 'increasingly likely' and could lead to delays at airports ”. Feedback on “Europe says no-deal Brexit looks 'increasingly likely' and could lead to delays at airports ”.